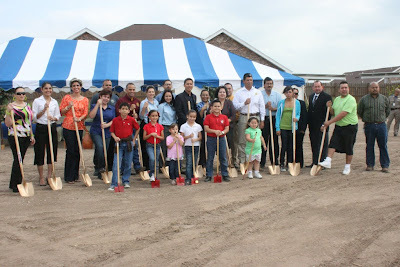 On Tuesday March 24, 2009 a ceremony was held at the location of Rio Grande City's first park. Mrs. Sara Cantu PARC Committee Member served as Mistress of Ceremonies. Mrs. Cynthia Garcia Fuentes PARC Chairman welcomed the attendees. The Honorable Ruben Villarreal-Mayor also welcomed everyone to this historic event. Mr. Juan Zuniga City Manager gave a brief history of the procedures in acquiring the funds and thanked all of the persons who were instrumental in ensuring that all requirements for the application were met. Heritage Park will be located directly north of the Rio Grande City High School on San Roberto St. on Alta Vista Subdivision. Children from the surrounding area were invited to attend the event and take part in the ceremony. The land was part of the park ordinance in which developers set aside land for park use. The developer Heritage Development set aside 4.5 acres. Heritage Park is set to be completed by the Summer 2009. The city applied for a grant from the Parks and Wildlife Department. The Parks, Arts and Recreation Commission, a committee appointed by the City Council to assist in planning and to serve in an advisory capacity worked with city leaders to design a park which would include activities for all ages. This Park will feature a Soccer Field, Basketball Court, Walking Trails, Kiddie Area, Restroom and a Pavilion for family gatherings. The Parks and Wildlife Commission approved the concept and granted Rio Grande City $50,000 for the project. Additional cost will come from the collection of Park Fees that have been accumulated. Park fees are assessed through new construction of buildings and homes. (Pictured with the children are: Mr. Juan Zuniga-City Manager, The Honorable Ruben Villarreal, Mr. Hernan Garza-Councilman, Mr. Rey Ramirez-Councilman, Bonnie Amador-Main Street Program Coordinator, Valerie Brown Garza-EDC Coordinator, Juan Perez-EDC, Cynthia Garcia Fuentes-PARC Chairman, Sara Cantu-PARC Member, Jessie Pena-PARC Member, Yolanda Mirelez-PARC Member, Manuel Muniz-Fire Department, R.J. Ramirez-Starr County Sheriff's Department, Trini Lopez-RGC Police Department, Elisa Beas-Planning Department Director, Cindy Alanis-Planning Dept.,Tony Cantu-Planning Dept., Gilbert Millan-Planning Dept., Eddie Dougherty-Parks Coordinator, Juan Lozano-Planning Dept., Linda Davila-Heritage Development, Blanca Juarez and other city and county citizens and leaders.